José Mourinho has criticised the football ‘Einsteins’ in the media who have been too quick to judge the form of Paul Pogba since he signed for Manchester United back in August. The French international scored twice as United dispatched Turkish side Fenerbahce in a 4-1 victory at Old Trafford, opening the scoring with a lovely penalty on 31 minutes after Juan Mata was brought down by Simon Kjaer. Right on half-time, Pogba scored a fabulous curling shot, after Wayne Rooney played a cross to Jesse Lingard who was able to set Pogba up to leave the Red Devils 3-0 up at half time. Mourinho requested that the media should be more realistic when it comes to making their opinions on the most expensive player in the world. The United boss said: “First of all, in some of your mouths, he goes from the worst player in the Premier League to a great player in 48 hours. “I am not specifically saying it is you. I say media, especially the Einsteins. We know he is a very good player. We know he needs some time to show his potential.” Mourinho continued. Pogba’s only other goal came against Leicester City, which coincidentally was also in a 4-1 win. Man of the match that day, Pogba put in a similar performance and looked great alongside the experienced Michael Carrick on Thursday which could be a beneficial partnership for the 23 year old midfielder. José signed Pogba from the Serie A and the Portuguese boss has experience with Inter Milan in Italy. He continued: “Different in the intensity, the number of touches on the ball, everything is different and he needs time to adapt. 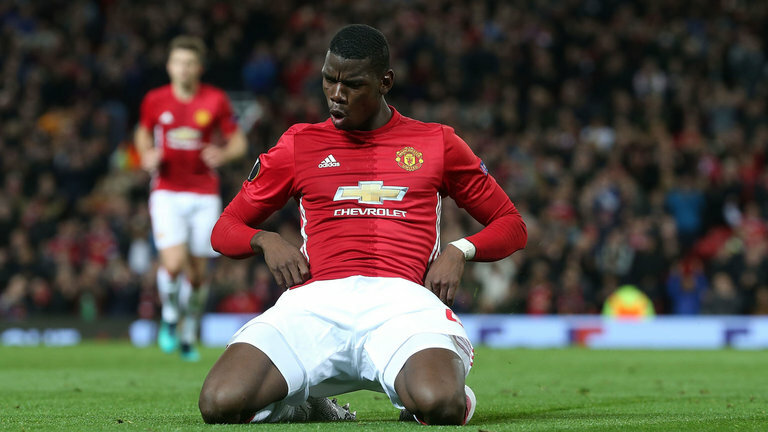 After a disappointing display at Anfield on Monday, it looked as though Pogba may have been given a rest ahead of the trip to Stamford Bridge on Sunday, but he was one of the four survivors from that starting side, with the likes of Ander Herrera, Daley Blind and Antonio Valencia given a deserved rest on Thursday. After Robin van Persie’s return to Old Trafford, marking it with a goal, Mourinho will be hoping to have a happy return to Chelsea on Sunday with a victory. It remains to be seen if Pogba will be given another chance behind Zlatan Ibrahimovic, or whether he will fit back into the holding role beside Herrera or Marouane Fellaini.